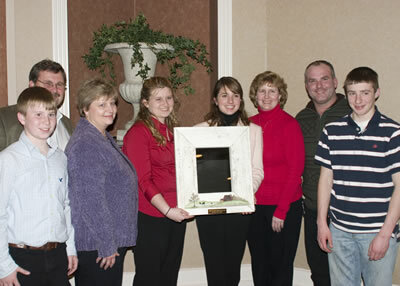 These young ladies were recognized as Pennsylvania Angus royalty at the 2009 Pennsylvania Angus Association Annual Meeting and Banquet, January 11 in Harrisburg, Pa. Pictured front row from left includes Shelby Dean, New Castle, Pa., sweetheart; Jaclyn Upperman, Chambersburg, Pa., 2008 queen; Katrina Frey, Quarryville, Pa., 2009 queen; Amanda Cole, Bentleyville, Pa., sweetheart; and Elizabeth Trowbridge, Meshoppen, Pa., sweetheart. Princesses pictured back row from left include Lindsay Upperman, Chambersburg, Pa.; Kate Livingston, Dover, Pa.; Heather Cox, Evans City, Pa.; Maria Trowbridge, Meshoppen, Pa.; and Hannah Grim, East Berlin, Pa. 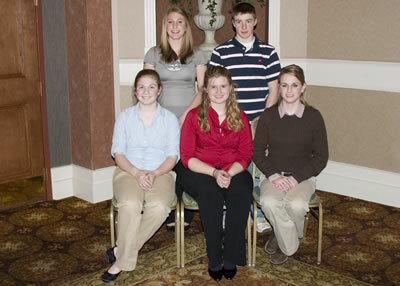 These young people will serve on the Pennsylvania Junior Angus Association board and are pictured at the 2009 Pennsylvania Angus Association Annual Meeting and Banquet, January 11 in Harrisburg, Pa. Seated from left includes Andrea Foore, Seven Valleys, Pa., secretary; Kate Livingston, Dover, Pa., president; and Hannah Grim, East Berlin, Pa., vice president. 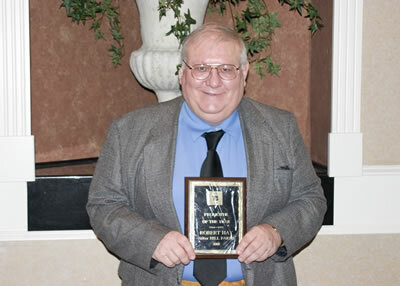 Standing from left includes Lindsay Upperman, Chambersburg, Pa., news reporter; and Fred Frey, Quarryville, Pa., treasurer. 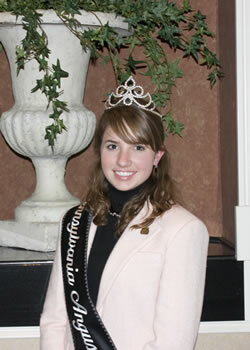 Katrina Frey, Quarryville, Pa., was crowned the Pennsylvania Angus queen at the 2009 Pennsylvania Angus Association Annual Meeting and Banquet, January 11 in Harrisburg, Pa. 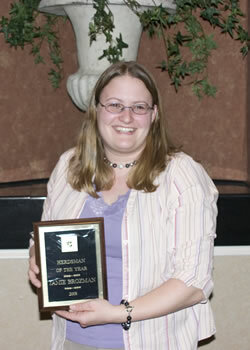 The Pennsylvania Junior Angus Association presented Kate Livingston, Dover, Pa., outstanding girl award, left; and Andrew Cranmer, Butler, Pa., outstanding boy award, right, at the 2009 Pennsylvania Angus Association Annual Meeting and Banquet, January 11 in Harrisburg, Pa.
Samuel and Sherrill Wylie III, Breezwood, Pa., donated a picture to the Pennsylvania Angus Association and it was auctioned off at the 2009 Pennsylvania Angus Association Annual Meeting and Banquet, January 11 in Harrisburg, Pa. The Frey family, Quarryville, Pa., paid $1,000 for the picture. Pictured from left includes Sherrill and Samuel Wylie III, and Fred, Fred and June Frey. 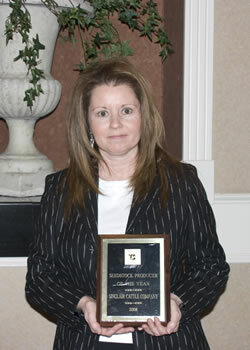 Sinclair Cattle Co., Warfordsburg, Pa., was named the Pennsylvania Angus Association's seedstock producer of the year at the 2009 Pennsylvania Angus Association Annual Meeting and Banquet, January 11 in Harrisburg, Pa. Pictured accepting the award is Rebecca Ward. 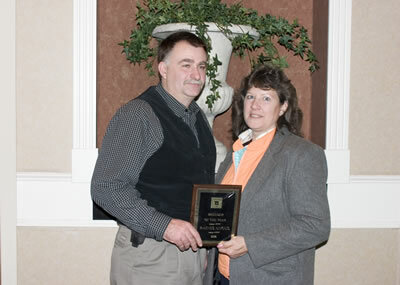 The Dale Rains family, Mercer, Pa., was named the Pennsylvania Angus Association's breeder of the year at the 2009 Pennsylvania Angus Association Annual Meeting and Banquet, January 11 in Harrisburg, Pa. Pictured from left includes Dale and Brenda Rains. 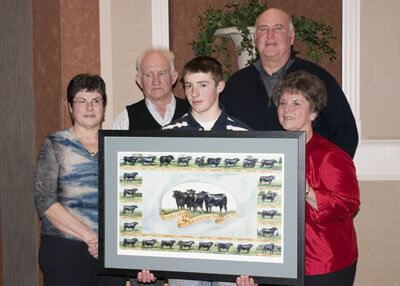 The Frey family was named the Pennsylvania Angus Association's family of the year at the 2009 Pennsylvania Angus Association Annual Meeting and Banquet, January 11 in Harrisburg, Pa. Pictured from left includes Kyle, Tim, Nancy and Kate Livingston, presenting the award; and Katrina, Nancy, Fritz and Fred Frey, all of Quarrysville, Pa., accepting the award. 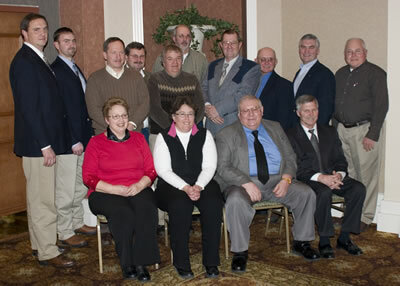 These men and women will serve on the Pennsylvania Angus Association board of directors and are pictured at the 2009 Pennsylvania Angus Association Annual Meeting and Banquet, January 11 in Harrisburg, Pa. Seated from left includes Barbara Weaver, New Holland, Pa., secretary; Cheryl Fairbairn, Coatesville, Pa., vice president; Robert Hay, Friedens, Pa., president; and Bradford Bishard, York, Pa., treasurer. Directors standing from left include Chad Cash, York, Pa.; Wendall Landis, University Park, Pa.; Gary Seefeldt, Port Allegany, Pa.; Tim Livingston, Dover, Pa.; Ned Hower, Bethlehem, Pa.; Eugene Trowbridge II, Meshoppen, Pa.; Harry Bachman, Annville, Pa.; Donald Nichols, Tyrone, Pa.; Erskine Cash, York, Pa.; and Thomas Gilliland, Troy, Pa.
Robert Hay, ErReR Hill Farms, Friedens, Pa., was named Pennsylvania Angus Association's promoter of the year at the 2009 Pennsylvania Angus Association Annual Meeting and Banquet, January 11 in Harrisburg, Pa.
Jamie Brozman, Bethlehem, Pa., was named the Pennsylvania Angus Association's herdsman of the year at the 2009 Pennsylvania Angus Association Annual Meeting and Banquet, January 11 in Harrisburg, Pa.
All photos courtesy of the American Angus Association.